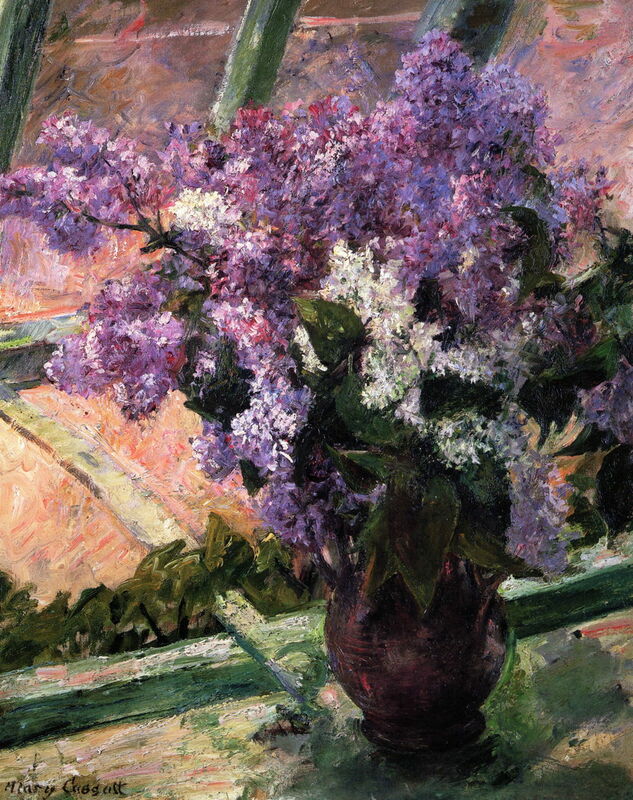 Mary Cassatt (1844–1926), Lilacs in a Window (Vase de Lilas a la Fenetre) (c 1880–83), oil on canvas, 61.5 x 51.1 cm, The Metropolitan Museum of Art (Partial and Promised Gift of Mr. and Mrs. Douglas Dillon, 1997), New York, NY. Courtesy of The Metropolitan Museum of Art. 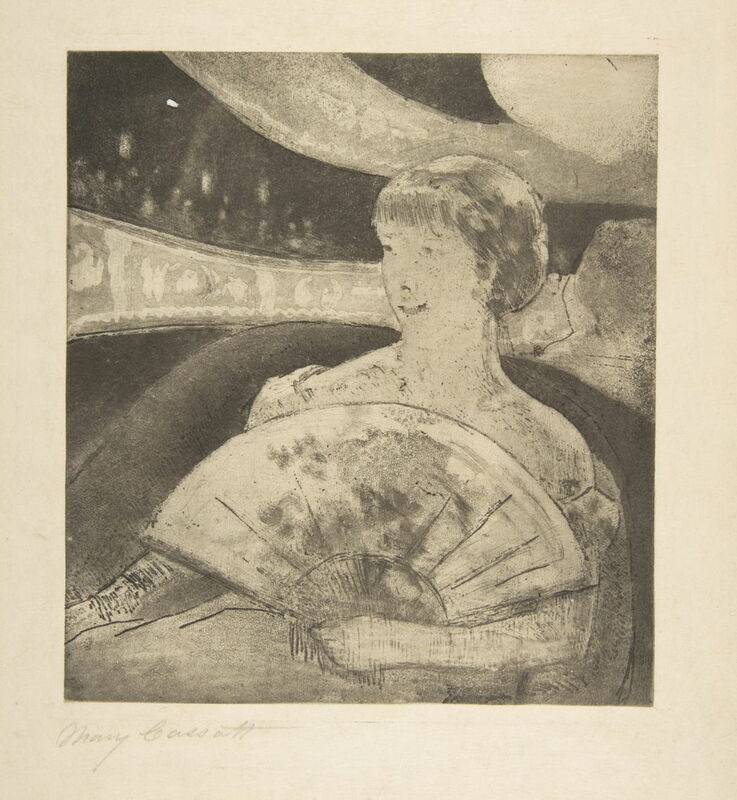 Mary Cassatt (1844–1926) worked hard to master her print-making techniques during the winter of 1879-80, under the guidance of her mentor and close friend Edgar Degas (1834–1917). Some of her incentive came from the collaborative project involving Degas, Cassatt, Pissarro, and others to produce a journal of their prints. Given the closeness and duration of their relationship, Degas and Cassatt seemed remarkably reticent about it. Repeated attempts to discover some underlying romantic or even sexual relationship have proved unsuccessful, and there is little doubt that it was mainly professional, with a varying element of friendship between two very private, forthright, and deeply self-driven artists. Mary Cassatt (1844–1926), Self-Portrait (c 1880), gouache and watercolor over graphite on paper, 32.7 x 24.6 cm, National Portrait Gallery, Washington, DC. Wikimedia Commons. Neither artist was enamoured with self-portraiture: Cassatt’s watercolour Self-Portrait (c 1880) is small and hurried, if brilliantly made. She never appears to have painted any portrait of Degas, although her mentor painted his self-portrait on several occasions, and appears happy for others to have painted or photographed him. 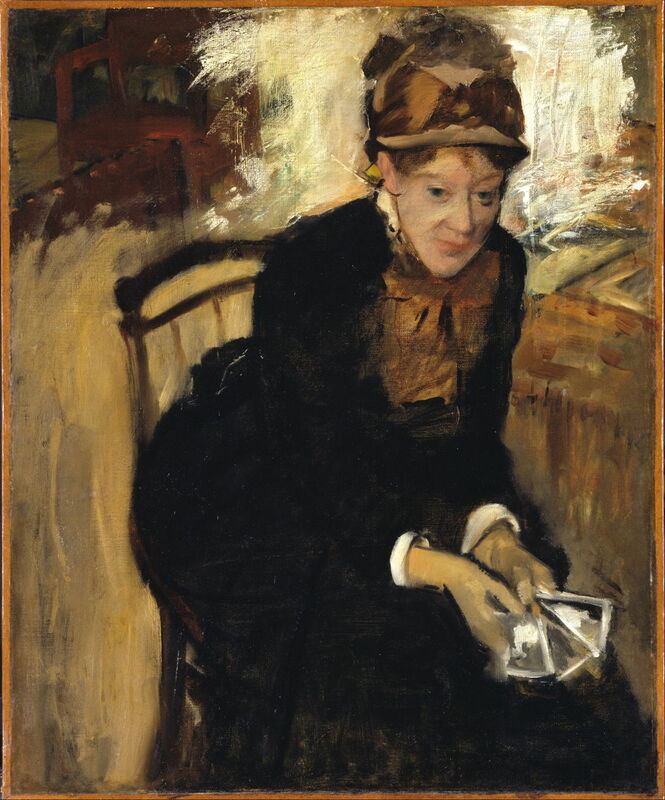 Edgar Degas (1834–1917), Mary Cassatt (Mary Cassatt Seated, Holding Cards) (c 1880-84), oil on canvas, 73.3 x 60 cm, National Portrait Gallery, Washington, DC. Wikimedia Commons. Cassatt continued to develop her painting style while she was working so hard on her print-making. Mary Cassatt (1844–1926), The Loge (c 1878-80), oil on canvas, 79.8 x 63.8 cm, The National Gallery of Art (Chester Dale Collection), Washington, DC. Courtesy of The National Gallery of Art, via Wikimedia Commons. Another of her masterpieces of this period, The Loge (c 1878-80) shows two of Cassatt’s friends at the theatre, again using the reflection in a mirror behind them to provide great depth and establish the context. 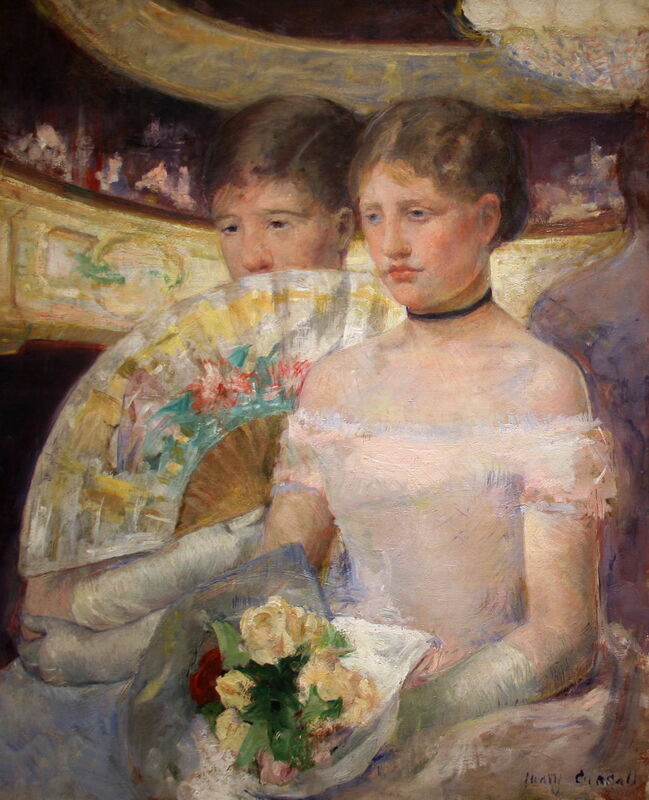 The woman on the left, whose mouth is obscured by her fan, is probably Mary Ellison from Philadelphia, who visited Paris at this time, while the other woman, who could be mistaken for a sister, is thought to have been the daughter of the poet Stephane Mallarmé, who was well-known in contemporary artistic circles. Mary Cassatt (1844–1926), The Cup of Tea (c 1880–81), oil on canvas, 92.4 x 65.4 cm, The Metropolitan Museum of Art, New York, NY. Courtesy of The Metropolitan Museum of Art, via Wikimedia Commons. 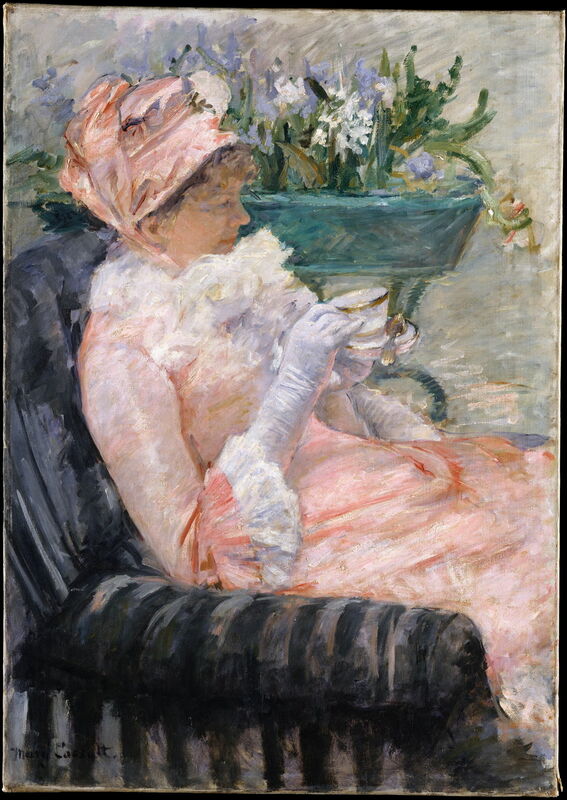 Cassatt continued to paint motifs from the sheltered world-view of an affluent woman, such as The Cup of Tea (c 1880–81), using wonderfully loose brushwork as seen in the oil sketches of Impressionists and others, like Giovanni Boldini (a member of Degas’ circle) and John Singer Sargent (who was starting his career in portraiture). Although Cassatt remained first and foremost a figurative painter, her flower study of Lilacs in a Window (c 1880–83) is an exception. This shows a vase freshly filled with cut flowers from the greenhouse, on a shelf by the open window. Her brushwork is here at its richest and most varied, from the linear marks on the shelf and window frame, to the staccato dabs of the flowers themselves. This painting was bought by Cassatt’s friend and patron, Moyse Dreyfus. 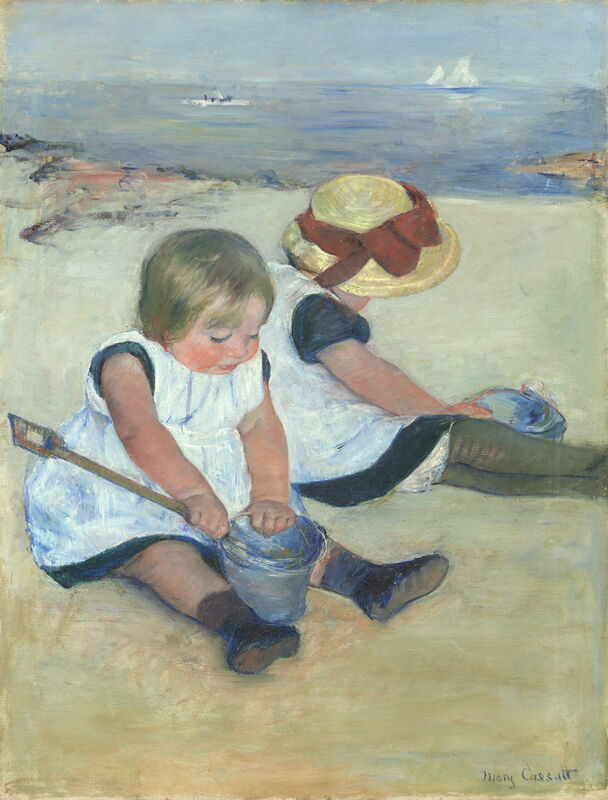 Mary Cassatt (1844–1926), Children Playing on the Beach (1884), oil on canvas, 97.4 x 74.2 cm, The National Gallery of Art, Washington, DC. Courtesy of The National Gallery of Art, via Wikimedia Commons. Those very textural flowers with their high chroma, contrast with Cassatt’s more usual paintings, such as Children Playing on the Beach (1884), which had nonetheless been influenced by her pastel works. Mary Cassatt (1844–1926), Woman on a Bench (c 1881), pastel on green wove paper, mounted on illustration board, 46.4 x 61.3 cm, The Metropolitan Museum of Art (Gift of Mrs. Gardner Cassatt, 1958), New York, NY. Courtesy of The Metropolitan Museum of Art. 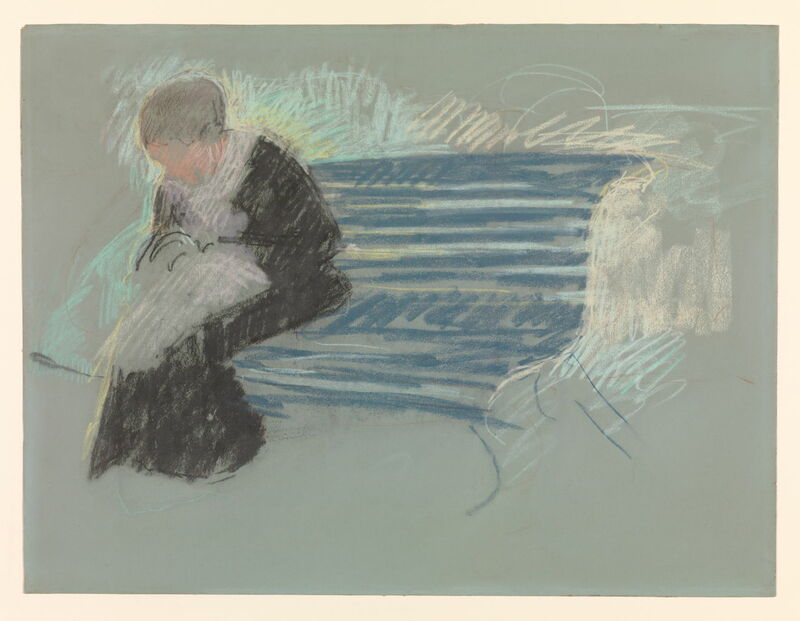 This quick pastel sketch of a Woman on a Bench (c 1881) shows clearly Cassatt’s use of diagonal strokes to lay down colour, a feature of many of Degas’ pastel paintings. 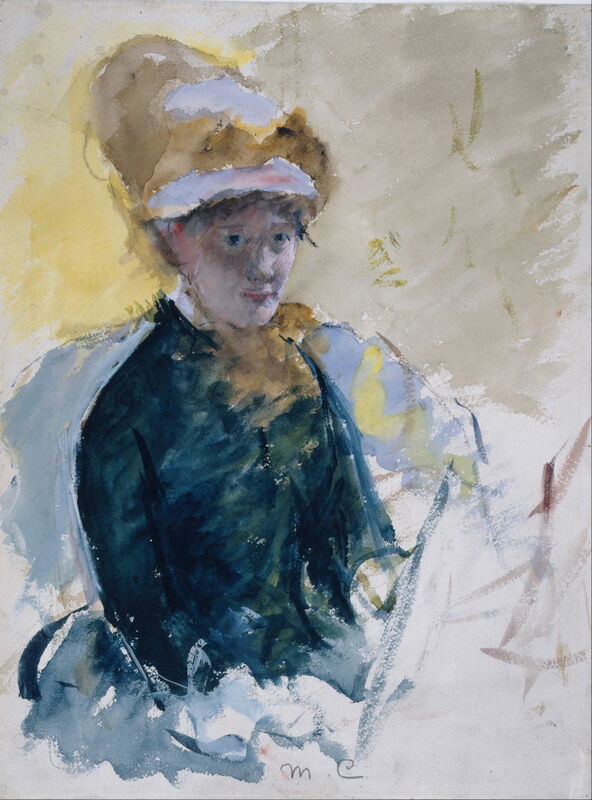 In her paintings in oils and pastels, Cassatt’s style and composition evolved under the influence of Degas. 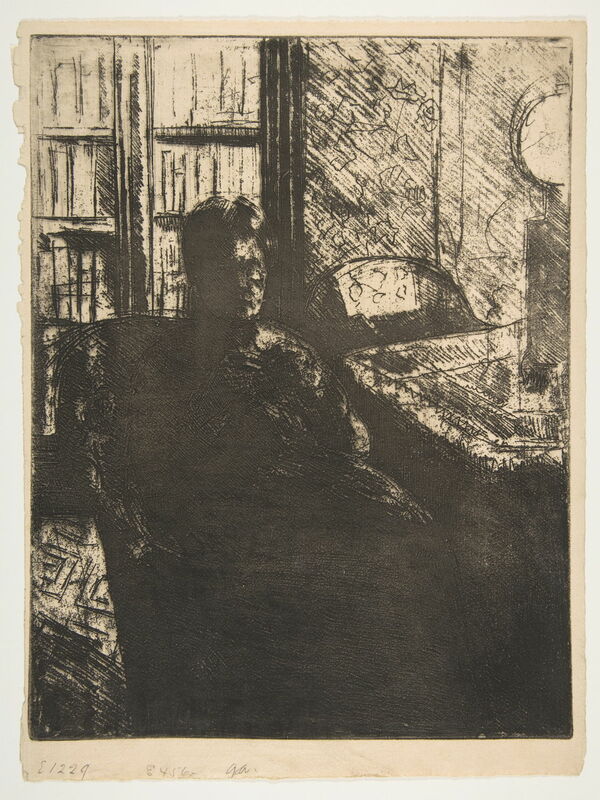 The greatest change occurred in her print-making, which was to become such an important part of her later work. Mary Cassatt (1844–1926), Knitting in the Glow of a Lamp (c 1880), soft-ground, second state of two, 29.4 x 22.9 cm, The Metropolitan Museum of Art (Rogers Fund, 1920), New York, NY. Courtesy of The Metropolitan Museum of Art. Cassatt’s first prints are often very dark and dense, as shown in her soft-ground of a woman Knitting in the Glow of a Lamp (c 1880). 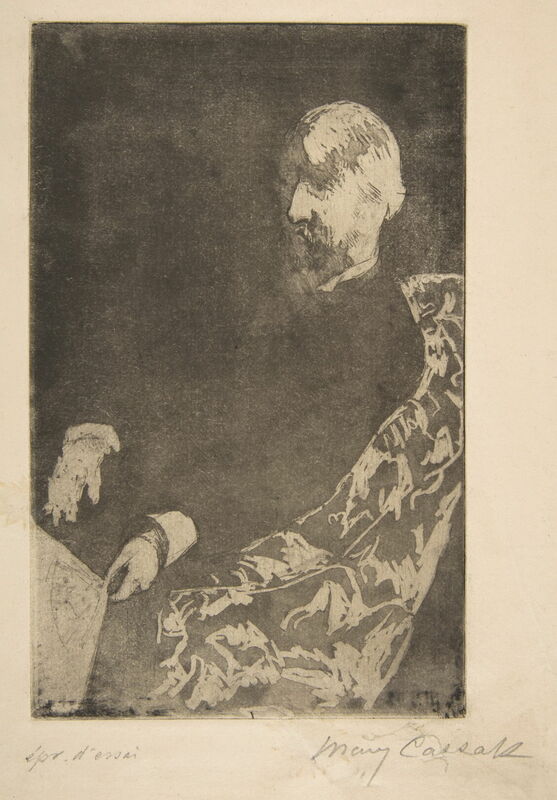 Mary Cassatt (1844–1926), Portrait of George Moore (c 1881), soft-ground etching, 22.2 x 15.1 cm, The Metropolitan Museum of Art (Rogers Fund, 1919), New York, NY. Courtesy of The Metropolitan Museum of Art. This soft-ground etched Portrait of George Moore (c 1881) is similar. Mary Cassatt (1844–1926), In the Opera Box (No. 3) (c 1880), soft-ground, aquatint and etching, fourth state of four, 19.7 x 17.8 cm, The Metropolitan Museum of Art (Gift of Mrs. Imrie de Vegh, 1949), New York, NY. Courtesy of The Metropolitan Museum of Art. Using motifs from her paintings, she learned more complex techniques, including the combination of soft-ground, aquatint and etching for her In the Opera Box (No. 3) (c 1880). This was one of a series of prints which she assembled for the planned journal. Then, in April 1880, Degas withdrew from that project, in a characteristic change of mind. Cassatt was upset by this, and for a while her relationship with Degas changed quite markedly. She continued to develop her print-making, but moved on from her motifs of women at the theatre. Posted in General, Life, Painting and tagged Cassatt, Degas, Dreyfus, Impressionism, painting, pastel, prints, women in art. Bookmark the permalink.